The Photokina Fair is the largest photo exhibition in the world, taking place every two years in Cologne, Germany. More than 1350 exhibitors, 170,000 visitors and 6,200 journalists from all over the world take part in this event, which is considered as one of the most impressive of its kind. 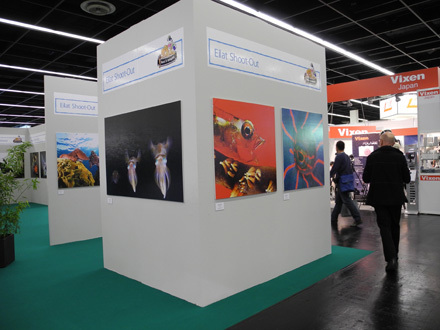 On 2010, Photokina organizers have provided Eilat Red Sea with a large exhibition and screening plot . Part of this plot was dedicated to an exhibition featuring the best underwater images submitted to the Eilat Red Sea competition during the years by photographers from all over the world. Another part of it was allocated for the favor of high definition live underwater broadcasts from the bottom of the Red Sea in Eilat, providing all Photokina visitors and journalists with the opportunity to share the amazing scenery of Eilat at real time through the most high technology devices. 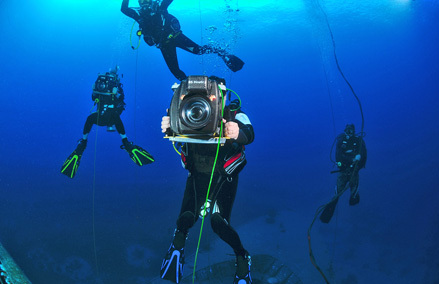 Technology was definitely a challenge throughout this project, mainly due to the fact that underwater full HD live broadcasts have never been carried out within such a fashion before. A few months prior to the Photokina Fair, David Pilosof, producer of Eilat Red Sea and these live broadcasts, had to consult with quite a few experts in order to figure out how such a setting can be successfully (and reliably!!) established. 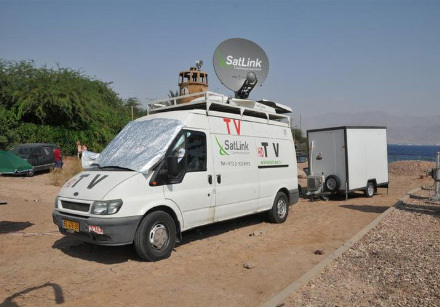 Countless meetings were carried out with communication organizations, high definition technology hardware suppliers and often with Sharon Sade, the production manager of the satellite team involved in this project – a company named SATLINK. Eventually, the setting established was based on ASI (Asynchronous Serial Interface) technology, which is an international standard for transmitting data in MPEG format without interfering with the quality of audio or video signals. Underwater, two Panasonic AG-HPX174 camcorders were accommodated inside specially designed BS Kinetics underwater housings, also making use of Light & Motion LED Lights for the purpose of producing vivid and colorful images. Video signals produced by these camcorders were transmitted via HD SDI cables to a Tandberg E5782 compressor positioned on a boat above, which converted the signals to an MPEG4 format. In addition, audio signals recorded by the microphone installed inside the underwater broadcaster’s full face mask, were transmitted through dedicated cables to the same compressor. Since earphones were fixed inside the full face mask as well, audio transmissions were bilateral, enabling the underwater broadcaster to fully communicate with people at the Photokina Fair. The six cables (two video and four audio) coming out of the compressor on the boat were braided and then stretched along the surface of the water, all the way to a satellite van positioned on land, where Editor Ram Gil, along with the Satlink professional satellite team, controlled the output. Using a series of professional routers and mixers, the signal was then sent to two different satellites, AMOS 5I and Atlantic Bird2, from which the Photokina Fair could be pick it up during the event. If it sounds complicated, you might bear in mind that this is only the essence of the setting(! ), which was first fully tested on July 28th, about two months prior to the Photokina Fair, in Eilat, Israel. Each of Eilat Red Sea live broadcasts at the Photokina Fair introduced a different fascinating item and location, including the unique interaction between dolphins and humans at Eilat’s Dolphin Reef, an underwater art exhibition established among colorful corals and featuring the work of the world famous artist - Shlomo Cohen, an underwater fashion photography session at the Satil wreck, the release of laboratory raised seahorses to the open sea by Eilat’s Underwater Observatory Marine Park and more. At the Photokina Fair, in Cologne, Germany, Presenter Razi Livnat, along with German-Translator Dirk Koenig, hosted the live broadcasts. In Eilat, Israel, live broadcaster Sharon Rainis introduced the different themes. During the live broadcasts, Photokina presenters, as well as fair visitors, carried out live conversations with the broadcaster and divers in Eilat, as they swim through the crystal clear water, colorful corals and fascinating creatures of the Red Sea. EPSON , Israeli Ministry of Tourism, Israeli Ministry of Culture & Sports, Eilat Municipality, Mares, BS Kinetics, Light & Motion, Israel Nature & Parks Authority, Eilat’s Hotels Association, Isrotel, Israir, Isrotel Manta Diving Center, Deep-Siam Diving Center, Eilat’s Dolphin Reef, Eilat’s Underwater Observatory Marine Park, MC1, Yam Magazine and Jugend Bros’ 2000.